John Graham McCrory opened his first store in Scottdale, Pennsylvania, in 1882. By 1885, the chain had five stores in Pennsylvania. J.G. 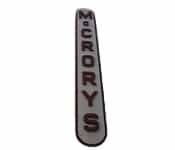 McCrory’s or McCrory Stores was a chain of five and dime stores in the United States based in York, Pennsylvania. The stores typically sold shoes, clothing, housewares, fabrics, penny candy, toys, cosmetics, and often possessed a lunch counter or snack bar.